When the National Football League Players Association and owners agreed to a new collective bargaining agreement in 2011, things around the league changed. While the game remained the same, there were many financial differences — mainly how the profits from advertisements, etc., were going to be allocated. But one other financial change occurred: the rookie wage scale. Before the CBA took place in 2011, rookie wages were somewhat ridiculous. Both 21- and 22-year-old players were getting record-setting contracts — contracts that not even some of the best veterans in the league were getting. Owners didn’t like this, but they were forced to pay because their prized, youthful players would just hold out until they did. Consider this: The then-St. Louis Rams drafted quarterback Sam Bradford in 2010 and he signed a six-year, $76 million contract. Since then, he has accomplished very little. In 2012, the Indianapolis Colts drafted Andrew Luck with the first overall pick. Luck signed a four-year, $22.5 million contract. That’s a difference of a little more than $7 million per year. In order to make rookie wages a little more reasonable, owners and the players association created a rookie wage limit. In other words, each team gets a certain amount of money they can spend on signing their rookies and undrafted free agents. No more, no less. A lot of the time, this has resulted in young players getting the league minimum (just look at third-round pick Russell Wilson’s initial four-year, $2.99 million contract). While this 2016 batch of rookies will assuredly not come remotely close to some of the pre-2011 rookie contracts, here are the 10 biggest rookie contracts — in total, not annually — in history. Aaron Curry, a linebacker out of Wake Forest, signed this six-year deal in 2009. Despite the impressively large contract, he never really panned out (one of many instances likely leading to the league’s new rookie wage scale). He retired from the NFL in 2012 — he didn’t even last the entire six years on his initial contract — having recorded 203 combined tackles and just 5.5 sacks. As a whole, Curry was a complete bust. JaMarcus Russell was drafted out of LSU with a lot of hype, evidenced by the Raiders taking him with the first overall pick in the 2007 draft. But similar to Curry, he accomplished diddly-squat. After three seasons in Oakland (and $32 million later), he was cut. Russell started in 25 games over a three-year stint with the Raiders, where he threw for 4,083 yards, 18 touchdowns, and 23 interceptions. To top Russell’s struggles and inconsistencies, he also held out after the draft. While he still would’ve received a big contract as the top overall pick, his holdout got him even more money. Russell is considered to be one of the biggest flops in draft history, and despite his apparent attempt to make a comeback this season, he just didn’t have what it took to make it as a top quarterback — or any kind of quarterback, for that matter — in the NFL. If there’s one trend characterizing the majority of this list, it’s players who got large contracts and failed to deliver –again, a big reason for the new limits on rookie contracts. Jason Smith is no different. He was a big, strong offensive tackle out of Baylor, taken with the second overall pick in 2009. Unlike the players before him, though, Smith suffered from injuries, which started with a concussion in 2010. His tenure with the Rams ended after being traded in 2012 to the New York Jets. Reggie Bush had everything coming out of USC: athleticism, a Heisman Trophy, and the skills to perform in the NFL. While he certainly didn’t turn into the likes of Adrian Peterson, he’s had a good run at the professional level. Unfortunately, while 2015 marked his 10th season in the league, Bush only managed to get on the field for five games with the San Francisco 49ers. Despite rushing for just 5,493 yards in his 10 years as a pro, Bush has also accumulated 3,508 receiving yards on 470 receptions and 53 total touchdowns. Needless to say, Bush is a dual-threat tailback, and what he lacks in his ability to pound the ball between the tackles, he makes up for with his versatility and good hands. With the third overall selection in 2010, Tampa Bay took Gerald McCoy, a defensive tackle out of Oklahoma. Both Ndamukong Suh and McCoy were selected within the top five that year, and both have since earned their big salaries. McCoy is a complete wrecking ball in the middle of the defense: he manhandles opposing lineman and completely disrupts teams’ offensive attacks. Not only has McCoy been named to the Pro Bowl four times (2012–15), he was also named All-Pro for a 2013 performance that saw him finish with 9 sacks and 35 tackles. Just as McCoy panned out on this list, Johnson has done so, too — maybe even more so. “Megatron,” as he’s nicknamed, has been one of the best wide receivers in the league since his first season while recently calling it a career with a total of 11,619 receiving yards and 83 touchdown receptions. While not everyone agrees, we think Johnson has mored than earned a place in the Pro Football Hall of Fame. Ndamukong Suh’s a unique addition to this list — while he has certainly earned his high salary, he also has a reputation, mostly based on his stomp in the 2011 Thanksgiving game, for being a dirty player. Either way, Suh’s performance on the field (assuming he isn’t taking foolish penalties), has been top notch. Similar to McCoy, Suh is a force to be reckoned with in the trenches. Not only did he earn the Associated Press Defensive Rookie of the Year award, but he was also named to the Pro Bowl in 2010, 2012, 2013, and 2014. His performances in 2010, 2013, and 2014 were good enough to earn him a first-team All-Pro selection. Matt Ryan was selected with the third overall pick in 2008 and received a whopping six-year, $70 million deal. At the time, this was a record-setting contract – something that hasn’t been too disappointing for Atlanta’s front office. To start, in 2008, Ryan earned the Associated Press Offensive Rookie of the Year award. Although he has yet to win a Super Bowl with the Falcons, he’s completed 64.3% of his passes for his career and been named to the Pro Bowl in 2010, 2012, and 2014. The Lions were truly a victim of the lack of a salary restriction for rookies. Quarterback Matt Stafford is the third Detroit player on this list, and all three occurred between 2007 and 2010. This was partially due to how bad the Lions were — they regularly had top-five picks — but also due to poor foresight from Detroit’s front office. 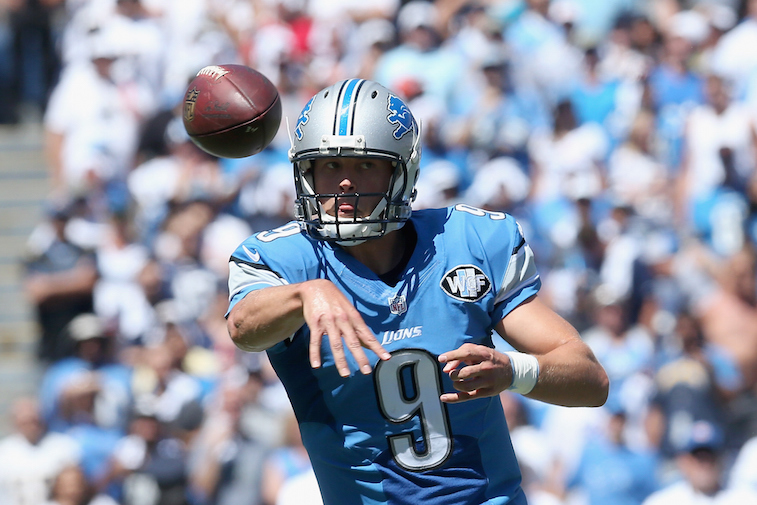 But the truth is, Stafford hasn’t been a flop. Although he only played in three games during his sophomore-year campaign, Stafford hasn’t missed a game since, and has thrown over 4,200 yards in each of the last five seasons. As far as the starting quarterback position is concerned, trust us, the Lions could do a whole lot worse. Drafted in 2010 by St. Louis, “Sammy Sleeves” signed the last rookie deal of its kind. Not only did he become the highest-paid rookie ever, but the extremity of his contract likely had a strong effect on the collective bargaining agreement a year later. However, Bradford hasn’t lived up the expectations set forth upon his arrival. Not by a long shot. He’s torn his ACL twice, never had a winning season, and seems to believe he is above a little quarterback competition. His stint with the Rams never panned out, and it is only a matter of time before the same thing happens in Philadelphia. While he’s not the same sort of bust that JaMarcus Russell was, he hasn’t exactly been a franchise QB. And it’s safe to say that he never will be. Statistics courtesy of Pro-Football-Reference, NFL.com, and The Richest.